Offering you a complete choice of products which include basil oil, clove oil, wheat germ oil, apricot oil, avocado oil and black pepper oil. Basil oil is obtained from the leaves of Ocimum basilicum also known as basil. It is a tender low - growing culinary herb. The oil is used as an antimicrobial and is very high in vitamins and minerals. It is regarded as protective and purifier. I t is native to India, Iran and other tropical regions of Asia, having been cultivated there for more than 5,000 years. 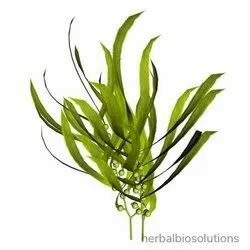 The dried leaves of O. basilicum contain 0.20-1% essential oil. The major compounds in the oil are linalool and methylchaviol. Other constituents include A-pinene, camphene, B-pinene, myrcene, limonene, cis-ocimene, camphor, linalool, methyl chavicol, Y - terpineol, citronellol, geraniol, methyl cinnamate and eugenol. It is having analgesic, antidepressant, antispasmodic, anti -venomous, carminative, cephalic, diaphoretic, digestive, emmenagogue, expectorant, febrifuge, insecticide, nervine, stomachic, sudorific, tonic and stimulant actions. 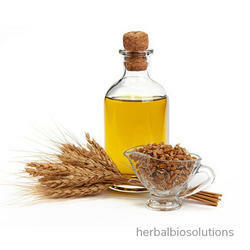 Wheat germ oil is obtained from the germ of the wheat embryo or kernel. Wheat germ constitutes the 2.5% of the wheat kernel. It is rich in octacosanol, a 28 carbon long-chain saturated primary alcohol and has been studied as an exercise and physical performance enhancing agent. It is also rich in vitamin E content. Fatty acid components include Linoelic acid, Palmitic acid, Oelic acid and Linolenic acid. Other uses of wheat germ oil includes to increase blood flow, reaction time, as well as for treating certain skin conditions . It also has a high content of Vitamin A, Vitamin D, protein and lecithin. It is very popular for external application due to its beneficial effects on the skin and hence is increasingly finding place in the manufacture of skin care products. It also have antioxidant properties, strengthening the immune system and restoring overall health. Apricot Oil is obtained from the seed kernels of Prunus armeniaca. It is a hard tree, bearing stone fruit, closely related to the peach. Apricot oil is pressed from the kernels of the Prunus armeniaca (apricot). The kernels have an oil content of 40-50%. The oil is similar to almond oil and peach oil, both of which are also extracted from the kernels of the respective fruit. Apricot oil and almond oil, are used similarly in cosmetics to soften skin. 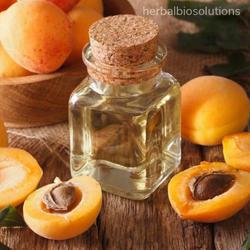 Apricot oil can be used on the scalp to improve its condition. The seed cake is also used separately to extract an essential oil, which contains Amygdalin - a colorless crystalline glucose. The oil is chiefly composed of unsaturated fatty acids, oleic acid and linoleic acid. Apricot oil is used as a substitute for Oil of Almonds, which it very closely resembles. It is less expensive and is considerably used in cosmetics, for its softening action on the skin. Use : As a fragrance and flavor ingredient, Aromatherapy oils, spa's oils, as a herbal Ingredient in cosmetic and medicinal Products. 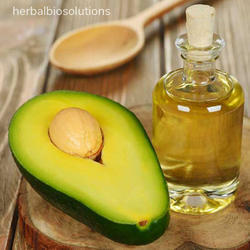 Avocado oil is extracted from the fruits of Persea Americana commonly known as avocado. It is a tree native to the State of Puebla in Mexico. Avocados are commercially valuable fruit and are cultivated in tropical climates throughout the world, producing a green -skinned, pear -shaped fruit that ripens after harvesting. It is used as an ingredient in food and as cooking oil. It is having regenerative and moisturizing properties and hence is used in cosmetics. It is also used as a carrier oil for other flavors. It is high in monounsaturated fats and Vitamin E. As a culinary oil, avocado oil compares well with olive oil. Like olive oil, avocado oil is one of few vegetable oils not derived from seeds; it is pressed from the fleshy pulp surrounding the avocado pit. Uses: As a fragrance and flavor ingredient, Aromatherapy oils, spa's oils, as a herbal ingredient in cosmetic and medicinal Products. Black Pepper Oil The oil is extracted from the seeds of Piper nigrum commonly called as Black pepper. The spiciness of black pepper is due to the chemical piperine. It has found its use alongside the table salt. 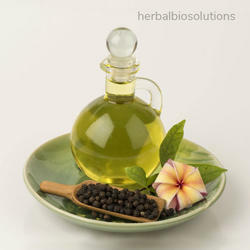 Oil of black pepper is normally utilized in nutrient, alterative therapy oils, and aromatherapy. Oil of black pepper is light yellow liquid watery with a sharp peppery smell. Oil of black pepper has more non-food usages, in aromatherapy and as a factor of alternative skin productions. The essential oil is noticed specifically for its activity for digestive charges Possible Uses of the oil are in the treatment of Aching muscles, arthritis, chilblains, constipation, muscle cramps, poor circulation, sluggish digestion. The major constituents are Limonene, Pinene, Myrcene, Phellandrene, Beta-caryophyllene, Beta-bisabolene, Sabinene, Linalol, Pinocarveol, Alpha, Terpineol, Camphene, Alpha, Terpenene. The Cajeput Oil is essential oil produced from the leaves and twigs of the Cajeput tree, Melaleuca leucadendron. This tree is native to Australia and Indonesia and is closely related to the tea tree, paperbark, punk, niaouli and eucalyptus trees. The cajeput tree is known as the white bark tea tree as it has a characteristic white bark. The cajeput oil is also known by different names like white tea tree oil, swamp tea tree oil. The oil contain cineol, terpineol, terpinyl acetate, terpenes, phytol, alloarmadendrene, ledene, platanic acid, betulinic acid, betulinaldehyde, viridiflorol, palustrol, etc. as some of the active ingredients. Externally, cajeput oil may cause skin irritation when used in high concentrations. It should be diluted before internal or external use. It is used as an analgesic, antiseptic, anti-neuralgic, flatulence, healing muscle and joint pain, for healthy looking skin, Gonorrhea and insecticide. Traditionally it is used for acne, easing breathing difficulties, treating colds and coughs, gastrointestinal problems, headaches, eczema, sinus infection, pneumonia etc. Uses:In perfumery, fragrance, flavor and in Ayurvedic Medicine. 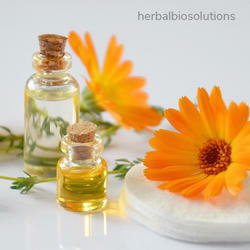 Calendula oil is obtained from the flowers of calendula officinalis commonly known as pot marigold. It is a genus of about 12–20 species of annual or perennial herbaceous plants native to the area from macaronesia east through the mediterranean region to Iran. Calendula has anti-inflammatory and vulnerary properties, making it excellent for help with stubborn wounds, ulcers, bed sores, varicose veins, bruises, rashes, eczema etc. It contains salicilyic acid, carotenoids, phytosterols. The principal constituents are flavinoids, saponosene, triterpenic alcohol and a bitter principle. Calandula oil also makes an excellent base for salves, facial creams and many other natural cosmetics. 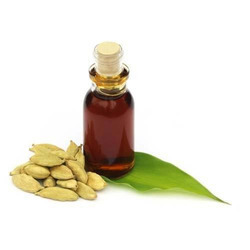 Cardamom oil is obtained from fruits of Elettaria cardamomum. It is a perennial, reed-like herb,grows wild and is cultivated in India and Ceylon. It grows up to 4 meters high and has long, green silky blades, small yellowy flowers with a violet tip and a large fleshy rhizome, similar to ginger. Oblong gray fruits follow the flowers, each containing many seeds. The major volatile constituents of cardamom oil are a - pinene, b-pinene, sabinene, myrcene, a -phellandrene, limonene, 1,8 -cineole, Y-terpinene, P-cymene, terpinolene, linalool, linalyl acetate, terpinen -4 -oil, a -terpineol, A-terpineol acetate, citronellol, nerol, geraniol, methyl eugenol and trans -nerolidol. Cardamom oil and oleoresin has applications in flavoring processed foods, cordials, and liquors and in perfumery and in Ayurvedic medicines. Uses:For flavoring liqueurs, pharmaceutical syrups, curry sauces, confectionary, baked goods. Chamomile oil is having two varieties Roman and German chamomile. Both Roman and German chamomile have calming and relaxing abilities, especially on the nervous and digestive systems, regulating and easing the menstrual cycle. They have soothing and healing influence on the skin, as well as being a potent remedy for inflammatory conditions. The main constituents of chamomile oil are chamazulene, a-bisabolol, bisabolol oxide A, bisabolol oxide B and bisabolone oxide A. 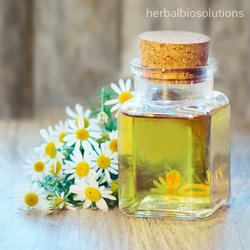 The therapeutic properties of chamomile oil are analgesic, anti- allergenic, anti-spasmodic, antibiotic, anti-inflammatory, antiphlogistic, bactericidal, carminative, cicatrisant, cholagogue, emmenagogue, hepatic, digestive, sedative, stomachic, vermifuge, vasoconstrictor and vulnerary. Cinnamon oil is obtained from the bark of Cinnamon Bark Cinnamomum cassia. It has been used as a culinary spice, for herbal bath decoctions and as a food remedy to maintain healthy blood sugar balance. Cinnamon contains the constituent, cinnamaldehyde, found in the volatile oil fraction of the plant. Cinnamaldehyde has potent antioxidant actions, protecting cells from oxidative damage, and supporting healthy fat and cholesterol balance within the normal range. Cinnamon bark also contains polyphenolic polymers that support healthy insulin and blood glucose balance within the normal range, and promote healthy blood flow. Use : As flavor in foods and in perfumes. 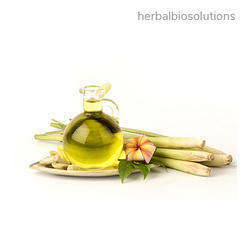 Citronella oil is one of the essential oils obtained from the leaves and stems of different species of Cymbopogan. The oil is used extensively as a source of perfumery. It contains the chemicals such as citronellal, citronellol . These chemicals find extensive use in soap, perfumery, cosmetic and flavoring industries throughout the world. Citronella oil is also a renowned plant -based insect repellent and has been registered for this use in the United States since 1948. The United states Environmental Protection agency considers oil of citronella as a bio -pesticide with a non-toxic mode of action. 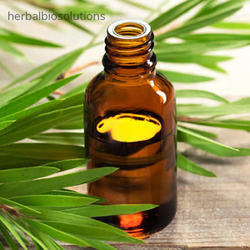 Research also shows that citronella oil has strong anti fungal properties, and is effective in calming barking dogs. 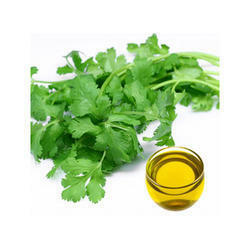 Coriander Oil is obtained from fruits of Coriandrum sativum. Coriander is an annual herb native to southern Europe and North Africa to southwestern Asia. It is a soft, hairless plant growing up to 50 centimeters tall. The essential oil from this ancient herb has a place in aromatherapy, as it helps to ease the mind and fight fatigue, while it warms and calms the digestive system, relieves rheumatism and arthritic pain, muscular spasms and detoxifies the body. Coriander oil has a sweet, spicy, warm smell, is nearly colorless to pale yellow and has a watery viscosity. The main chemical components are borneol, linalool, cineole, cymene, terpineol, dipentene, phellandrene, pinene and terpinolene. Coriander oil can be useful to refresh and to uplift the mind. It can help for mental fatigue, migraine, tension and nervous weakness. It has a warming effect on the stomach and relieve wind and cramps, while revitalizing the glandular system. 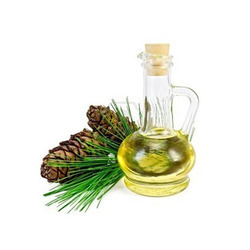 Cypress Oil is obtained from Cupressus sempervirens. Cypress is the name applied to many plants, which is a conifer of northern temperate regions. Most they are trees, while a few are shrubs. 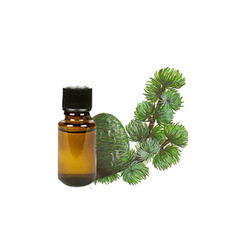 Cypress oil has a woody, slightly spicy and refreshing masculine smell. The oil is colorless to very pale yellow in color and watery in viscosity. The main components of cypress oil are A-pinene, camphene, sabinene, B-pinene, D-3carene, myrcene, a-terpinene, terpinolene, linalool, bornyl acetate, cedrol and cadinene. Cypress oil has a calming and soothing effect on the irritable, angry and stressed-out person and has a valuable effect as a vasoconstrictor on varicose veins and hemorrhoids. It is beneficial in conditions of excess fluid, such as bleeding, nosebleeds, heavy menstruation, heavy perspiration, cough and bronchitis, hemorrhages and fluid retention. The antis pasmodic action is very useful for asthma, whooping cough, bronchitis, emphysema and influenza. Main Constituents Alphapinene, Betapinene, Limonene, caryophylene, camphene, terpeneol, cyprus camphor and other sesque terpenes. 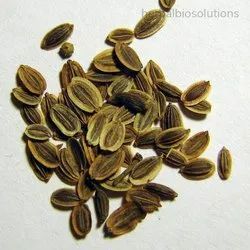 Dill Seed Oil is obtained from seeds of Anethum graveolens. Dill is a herbaceous annual with pinnately divided leaves. The ripe, light brown seeds emit an aromatic odor. The leaves have pleasant aromatic odor and warm taste. Both seeds and leaves are valued as spice. It is a short-lived perennial herb, 40–60 cm (16–24 in), with slender stems and alternate, finely divided, softly delicate leaves 10 –20 cm (3.9–7.9 in) long. Dill oil contains Carvone, limonene, phellandrene, eugenol, pinen. Dill seed is used both whole and ground as a condiment in soups, salads, processed meats, sausages and pickling. Dill stems and blossom heads are used for dill pickles. The essential oil is used in the manufacture of soaps. Both seeds and oil are used in indigenous medicinal preparations. The emulsion of dill oil in water is an aromatic carminative. Use : In herbal formulation as a natural ingredient in gripe waters; raw material in fragrance and flavors. Frankincense is not a herb but a resin that oozes out from the trees of Boswellia. Some of the species in the genus Boswellia are the sources of true, aromatic resin which is also called as olibanum. There are different grades of resin and are collected from the 10 year old tree. Frankincense is traded from Arabian countries all over the world for their aroma and incense. Frankincense oil is distilled from the resin. It has a spicy smell and is slightly yellowish in colour. The main chemical components of frankincense oil are a-pinene, actanol, linalool, octyl acetate, bornyl acetate, incensole and incensyl acetate.The compounds in frankincense oil makes it not only an aromatic substance but also healthy oil with properties like antiseptic, astringent, carminative, cicatrisant, cytophylactic, digestive, diuretic, emmenagogue, expectorant, tonic, uterine, vulnerary and expectorant. Garlic Oil is obtained by crushing the cloves of garlic in such a way that the essential oil can be extracted in pure form. Garlic oil is used for various purposes like taste infuser in cuisines, as a cure for ear infections. 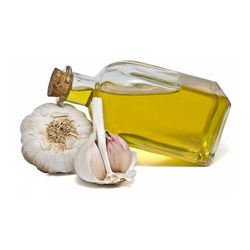 Oil of garlic is used as a flavoring agent in soups, canned foods, sauces etc. It is also recommended as a cholesterol lowerer due to the presence of chemical constituents like diallyl disulphide, alliin, dodecanol and allitol. It acts as an antibiotic, anti-viral, decongestant, and expectorant. 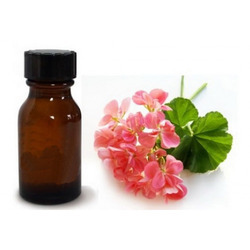 Geranium oil is extracted from the plant Pelargonium geranium. It is a strong smelling oil with a floral aroma and a hint of mint. The oil is mostly colorless, but can have a slight light green color to it. It has a watery viscosity. It is composed of various chemical constituents and includes α -pinene, myrcene, limonene, menthone, linalool, geranyl acetate, citronellol, and geranyl butyrate. Geranium oil can be used to help in the treatment of acne, bruises, burns, cuts, dermatitis, eczema, hemorrhoids, lice, as a mosquito repellant, ringworm, ulcers, breast engorgement, edema, poor circulation, sore throat, tonsillitis, PMS, menopausal problems, stress and neuralgia. Solubility Insoluble in water soluble in alcohol and other organic solvents. It is obtained from the rhizomes of Zinger. The leafy shoot is a pseudo stem formed by leaf sheath and bears 8 to 12 distichous leaves. 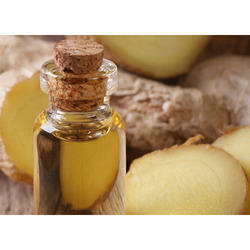 Fresh ginger, dry ginger powder, oleoresin and oil are used in food processing. It is indispensable in the manufacture of ginger bread, confectionary, ginger ale, curry powders, certain curried meats, table sauces, in pickling and in the manufacture of certain cordials, ginger cocktail, carbonate drinks, liquors etc. I n medicine, it is used as carminative and stimulant. The health benefits of ginger root oil can be attributed to its digestive, carminative, expectorant, antiseptic, analgesic, anti inflammatory, stimulating and aphrodisiac properties. These benefits of ginger oil include its ability to treat stomach problems, nausea, heart strokes, indigestion, inflammations, respiratory problems, menstrual disorders, etc. Jasmine Oil is obtained from Jasminum grandiflorum. Jasmine is a genus of shrubs and vines in the olive family with about 200 species, native to tropical and warm temperate regions. The leaves can be either evergreen or deciduous (falling in autumn). Jasmine essential oil has a sweet, exotic and richly floral smell. The main chemical components are benzyl acetate, linalool, benzyl alcohol, indole, benzyl benzoate, cis-jasmone, methyl anthranilate and trace amounts of P. cresol, farnesol, cis-3-hexenyl benzoate, eugenol, nerol, ceosol, benzoic acid, benzaldehyde, Y-terpineol, nerolidol, isohytol, phytol etc. It is having anti-depressant, antiseptic, anti-spasmodic, cicatrisant, expectorant, galactagogue, parturient, uterine properties. Use : As a fragrance and flavor ingredient, Aromatherapy oils, spa's oils, as an herbal ingredient in cosmetic and medicinal products. Jojoba oil is the liquid wax produced in the seed of the jojoba ( Simmondsia chinensis) plant, It is a shrub native to southern Arizoma, southern california and northwestern Mexico. The oil makes up approximately 50% of the jojoba seed by weight. Jojoba oil is a mixture of wax esters, 36 to 46 carbon atoms in length. Each molecule consists of a fatty acids, and a fatty alcohol joined by an ester bond. 98% of the fatty acid molecules are unsaturated at the 9th carbon -carbon bond (omega-9). 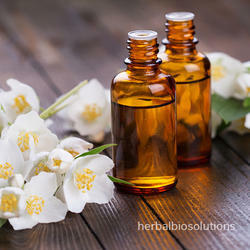 Jojoba oil is used as a replacement for whale oil and its derivatives, such as cetyl alcohol. The ban on importing whale oil to the US in 1971 led to the discovery that jojoba oil is "in many regards superior to sperm oil for applications in the cosmetics and other industries. Jojoba oil is a fungicide, and can be used for controlling mildew. Solubility Insoluble in water and soluble in other organic solvents. Juniperberry Oil is obtained from berries of Juniperus communis. An evergreen shrub or tree up to 6m high with bluish-green stiff needles. It has small flowers and berries that are green in the first year, black in second and third. Essential oil is extracted by steam distillation from the berries. It is Used medicinally for urinary infections, for respiratory problems as well as gastro- intestinal infections and worms. It helps expel the build-up of uric acid in the joints and is employed in gout, rheumatism and arthritis. It is also used in Fluid retention, ulcers, obesity, acne eczema, mental exhaustion, overindulgence of food, premenstrual bloating, sciatic and hay fever. It blends well with Vetiver, sandalwood, cedar wood, oak moss, galbanum, elemi, cypress, clary sage, pine, lavender, fir needle, rosemary, benzoin, geranium, and citrus oils. Use : In manufacture of liquors, in aromatherapy and spa oils, in perfumery, as a food flavouring substance, etc. Lavender oil is obtained from the flower spikes of the species of Lavender. 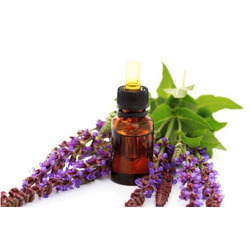 It is available in two forms, lavender flower oil which is a colorless oil, insoluble in water, having a density of 0.885 G/ML and lavender spike oil, a distillate from the herb Lavandula latifolia , having density 0.905 g/ML. It is composed of mixture of phytocon stituents like linalool and linalyl acetate. Other components include α- pinene, limonene, 1,8 -cineole, CIS- and trans-ocimene, 3-octanose, camphor, caryophyllene, terpinen-4-OL and lavendulyl acetate. The essence of the oil have calming effect which may aid in relaxation and may reduce anxiety. It may also help to relieve pain from tension headache when breathed in as vapor or diluted and rubbed on the skin. lavender oil can be used for the treatment of cough and respiratory infections in the form of vaporizer. It can also be used as mosquito repellent. Lemon oil is obtained from Fruits of Citrus limonum. The lemon is a small evergreen tree native to Asia. The fruit is used for culinary and non culinary purposes throughout the world – primarily for its juice, though the pulp and rind are also used, mainly in cooking and baking. It is usually yellowish or light green in color, and smells like freshly sliced lemon. 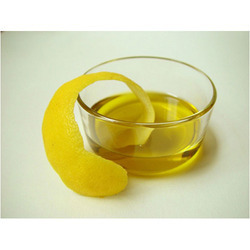 Lemon oil is used in personal care products, home cleaning products, and furniture polishes. It has its applications in aromatherapy for relieving anxiety, for body ache, for improving circulation, treatment of cellulite or warming hands and feet. It has anti -anemic, antimicrobial, anti-rheumatic, anti- sclerotic, antiseptic, bactericidal, carminative, cicatrisant, depurative, diaphoretic, diuretic, febrifuge, haemostatic, hypotensive, insecticidal, rubefacient, tonic and vermifuge properties. Main Constituents limonene, terpenene, phellandrene, pinene, citral , citronellal, geranyl acetate, and sesqui-terpenes. The mandarin oil is obtained from mandarin tree a member of the orange family. It is a small glossy evergreen tree achieving six meters height with fragrant flowers and fleshy fruit. The essential oil is extracted from outer peel of the mandarin. The oil have flowery, sweet aroma. This oil is believed to improve mood and relieve anxiety. The smell of the oil gives the feeling of cleanliness and has been found to be safe. It has the ability to relieve stress, depression and sadness and can act as a gentle . It has Antiseptic, anti spasmodic, carminative, digestive, diuretic, laxative, , stimulant, digestive and tonic properties. 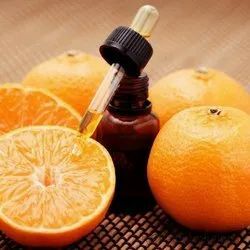 Mandarin oil is safe to use during pregnancy, a blend of Lavender, Mandarin and Neroli in 10 ml of sweet almond oil and 2 ml of wheat germ oil can be used for the prevention of stretch marks. It is also useful for treating acne, oily skin and spots and have also indicated for the treatment of fluid retention and obesity. It also have the applications in soaps, cosmetics, and perfumes, especially colognes. It is also used as a flavoring agent i n liqueurs sweets and drinks. Mandarian oil has been found Non-toxic, non-irritant, non-sensitizing. Marjoram oil is obtained from Origanum marjorana. This is a tender cold-sensitive, bushy perennial herb, reaching up to about 60 cm height, with hairy stem, dark green oval leaves and small white or pink flowers. It has sweet pine and citrus flavor. The major terpenoids present are sabinene, α -terpinene, Y-terpinene, P-cymene, terpinolene, linalool, CIS-sabinene hydrate, linalyl acetate, terpinen-4-ol and y-terpineol. It has analgesic, anti- spasmodic, anaphrodisiac, antiseptic, antiviral, bactericidal, carminative, cephalic, cordial, diaphoretic, digestive, diuretic, emmenagogue, expectorant, fungicidal, hypotensive, laxative, nervine, sedative, stomachic, vasodilator and vulnerary properties. It is warm in action and have calming effect, relieves anxiety and stress. It has good muscle relaxant properties and the pain killing properties which are useful for rheumatism, sprains, strains and spasms, as well as swollen joints and painful muscles. Uses:In perfumes, flavours, aromatherapy oils, spa oils, cosmetic and medicinal products. Storage:Well closed in air tight containers away from sunlight and heat preferably in amber color glass containers. The essential oil is obtained from the seeds of the tree Myristica fragrances. It is an evergreen tree indigenous to the Banda Islands in the Moluccas of Indonesia. Two important spices are derived from the fruit, nutmeg and mace. Mace is the dried reticulated ‘aril’ of the fruit and nutmeg is the dried seed kernel of the fruit. The oil is used heavily in Perfumery and pharmaceutical industries. The oil is colorless or light yellow and smells and tastes of nutmeg. It is used as a natural food flavoring in baked goods, syrups, beverages and sweets. In cosmetic and pharmaceutical industries it is used in toothpastes and in some cough syrups. 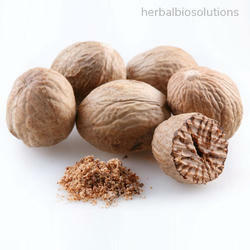 In traditional medicine nutmeg and nutmeg oil were used for illnesses related to the nervous and digestive systems. The active component, Myristicin is considered to have hallucinogenic effect. It also have the applications in toothache and rheuma tic pain. Orange oil is obtained from glands inside the rind of orange fruit. It is mostly composed of mostly D -limonene. The orange is a hybrid of ancient cultivated origin, possibly between pomelo (Citrus maxima) and mandarian (Citrus reticulata). It is a small flowering tree growing to about 3 M tall with evergreen leaves, which are arranged alternately, of ovate shape with crenulate margins and 4–10 cm long. The orange fruit is a hesperidium, a type of berry. 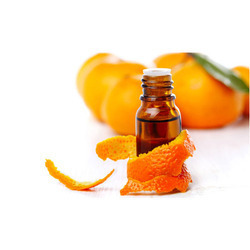 Sweet orange oil has a sweet, fresh and tangy smell, is yellow to orange in color. The orange oil have antiseptic, anti-depressant, antispasmodic, anti-inflammatory, carminative, diuretic, cholagogue, and tonic properties. Uses:As a herbal food supplement, fragrance and flavor ingredient, as an herbal ingredient in cosmetic and medicinal products. Pumpkin seed oil is obtained from the seeds of Cucurbita pepo. 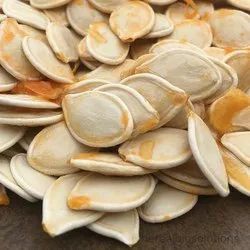 It is prepared by pressing roasted hulled pumpkin seeds. It has been produced and used in Styria's southern parts at least since the 18th century. The viscous oil is light to very dark green to dark red in colour depending on the thickness of the observed sample. The oil appears green in thin layer and red in thick layer. Pump kin seed oil has an intense nutty taste and is rich in polyunsaturated fatty acids. Browned oil has a bitter taste. It has been found useful in the treatment of benigan pro static hyperplasia, irritable bowel syndrome, also found to prevent atherosclerosis and regulate cholesterol levels. In German folk medicine, it has been a remedy for parasitic infestations of the intestinal tract such as tapeworm. It is composed of unsaturated fatty acids like myristic, palmitic, stearic, oleic, li noelic and linolenic acids. Uses:As a fragrance and flavor ingredient, Aromatherapy oils, spa's oils, as an herbal Ingredient in cosmetic and medicinal Products. 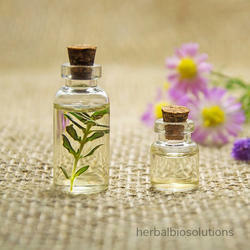 Thyme oil is extracted from leaves and flowering tops of Thymus vulgaris. Thyme is a culinary and medicinal herb. The major volatile constituents are a-thujone, A-pinene, camphene, B-pinene, P-cymene, a-terpinene, linalool, borneol, b-caryophyllene, thymol and carvacrol. It has antirheumatic, antiseptic, antispasmodic, bactericidal, bechic, cardiac, carminative, cicatrisant, diuretic, emmenagogue, expectorant, hypertensive, insecticide, stimulant, tonic and vermifuge properties. The main component Thymol is a powerful antiseptic. Thymol has been reported for its antibacterial, antiviral, and anti-fungal action, kills the anthrax bacillus, the typhoid bacillus, meningococcus, and the agent responsible for tuberculosis and is active against salmonella and staphylococcus bacteria. It has also been studied for its effects on gingivitis and plaque-caused organisms in the mouth and is used in mouth washes (Listerine) for its antiseptic actions. Wintergreen oil is obtained from is a group of plants commonly known as they remain green through the winter. 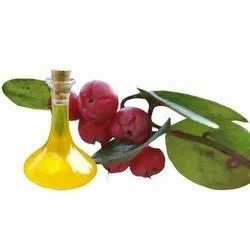 It is generally extracted from the species of Gaultheria. The major component is an ester Methyl Salicylate ( about 98%), which is found to protect the plants from insects. Other components includes α - pinene, myrcene, delta -3 -carene, limonene, 3,7 - guaiadiene and delta -cadinene. Methyl salicylate is used as a rubifacient ( Counterirritant) in deep heating liniments flavoring agent and fragrance in small amounts. It can cause stomach and kidney problems in higher quantities. The oil is used topically (diluted) or in aromatherapy for muscle and joint discomfort, arthritis, cellulite, obesity, edema, poor circulation, heart diseases, hypertension, rheumatism, tendentious, cramps, inflammation, eczema, hair care, psoriasis, gout, ulcers, broken or bruised bones. It is also used in some perfumery applications and as a flavoring agent, toothpaste, chewing gum and soft drinks. Uses: As a fragrance and flavor ingredient, Aromatherapy oils, spa's oils, as an herbal ingredient in cosmetic and medicinal products. Peppermint oil is obtained from mentha arvensis. It is native to the temperate regions of Europe and western and central Asia, east to the Himalaya and eastern Siberia and north America. It is a herbaceous perennial plant growing to 10 -60 CM height. The leaves are in opposite pairs, simple, 2 -6. 5 CM long and 1-2 CM broad, hairy, and with a coarsely serrated margin. 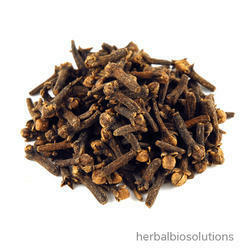 The major component is menthol and have local anesthetic and counter irritant qualities. It is the component of the products meant to relieve sore throat and minor mouth or throat irritation, muscle aches, sprains, and similar conditions. It has been proved as anti fungal and antibacterial agent. 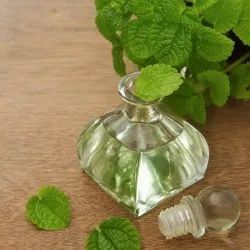 It is widely used in confectionery, perfumery, mouth fresheners, cough drops, tobacco goods, medicated oils tooth pastes analgesic balms, lotions, shampoos, chewing gums, candies.